Farm Radio International (www.farmradio.org) is a Canadian-based, non-profit organisation, that assists small scale farmers in Africa with food security. Farm Radio works with over 290 partner radio stations across Africa to train broadcasters, create radio scripts and conduct educational radio campaigns on agricultural topics that can improve the livelihoods of farmers. "...there are a few shortcomings of radio: if you miss the show, you miss the info; with radio it is not possible to make information available on demand. Radio also lacks a reliable channel for interacting with listeners. This is a pitfall for Farm Radio because although radio is the primary 'media' source of information for farmers, we know that their favourite source is their peers - other farmers!" Since January 2010, Farm Radio has been using Freedom Fone to increase the impact of their educational radio programmes and involve more farmers' voices. Early in 2010, Radio Maria in Tanzania conducted a campaign on best practices for small scale poultry farming. One specific objective was to help decrease chicken death rates from 60% to 20% with simple, low-cost, very practical advice. In partnership with Radio Maria, Farm Radio decided to hold a competition to assess how the poultry farmers of the area had been impacted by the campaign. The competition was set up using Freedom Fone's Leave-a-Message (LAM) function and was advertised on-air through a series of radio jingles. Farmers were invited to call in and comment on the impact of the campaign and asked what they intended to do to improve their farming practices. Awards to winners were 20 colourful Kuku Hotline T-shirts. "First, I plan to build a proper house for my chickens to keep them safe and care for them - the money I get from their eggs, I will use to improve my business. Secondly, I will open a bank account to save money for my children's school fees. Thanks to the Kuku Hotline, thank you"
The service received over 1,400 calls in one month. On the final two broadcasts of the campaign, the 20 winning messages were broadcasted on Radio Maria. 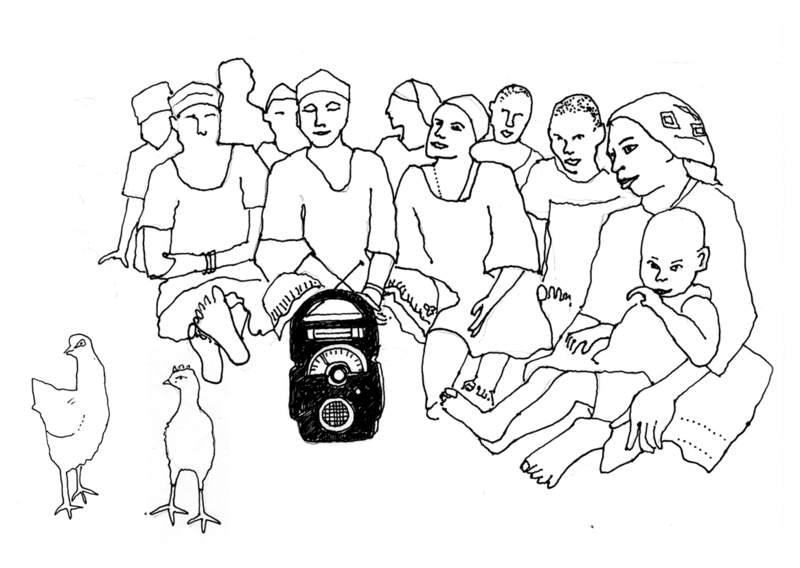 The Kuku Hotline became popular because it included the actual voices of farmers on the radio. This encouraged Radio Maria and Farm Radio International to use Freedom Fone to make radio more interactive and create more participatory radio campaigns. "To leave a message for the radio presenters press 3" would give the farmer a chance to ask a question or leave a message for the programme. "By providing farmers with up to date market prices they can make informed decisions. For example, once I know that my sweet potatoes would sell for 1.2 dollars/kg in the Abotoasi market and 1.4 dollars/kg at Akatsi market, which is 20 km further from my home, I can decide whether it is worth arranging transport to go the extra mile to Akatsi or not - it might still be too far away!" says Sullivan. Between January and April 2010, the service received over 4,500 calls. There was a group of about 50 farmers who used the service consistently from week to week and it would take them about two minutes to get the market price information they wanted before ending the call. Most calls were received before 6 am in the morning, when calls are cheaper. Although call costs remain a challenge, farmers still used the service because they were getting actual value from the information provided. "We provided farmers with information that was really making a difference to them. And the radio stations we partnered with naturally had the skills and equipment for audio scripting, recording and editing. For them, using Freedom Fone proved very easy," explains Sullivan. Today, Farm Radio International continues to use Freedom Fone for agriculture related information and have extended their reach to Mali. Opportunities in Uganda and Malawi are also under consideration.